It's Friday, and time for another Bloggers Challenge post. We've all enjoyed the inspiration challenges so much, that we've decided to have an inspiration challenge monthly - be sure to check out the creative challenge players blogs on my side bar. My blog readers are more than welcome to join me in the challenges - just leave comment in this post, with a link to where I can see your inspiration post. For this weeks challenge I really had nothing in mind until today when I got an email from Archivers - I saw the Karen Foster Designer Series Paper, and thought - I could work with that! Now I have an idea - where to I want to go with it? So, I start to rummage through my stash of alterable items and what do I find? This cleverly laid out frame , which gave me just the inspiration that I needed to complete my project. I bet you'll be surprised to know, I didn't use Jolliest Time of the Year, but instead reached for my lovely Baroque Motifs set! Here's my completed project - using the Karen Foster Paper and the Frame for my inspiration. I hope you've been inspired to look at the objects around you in a more creative way! 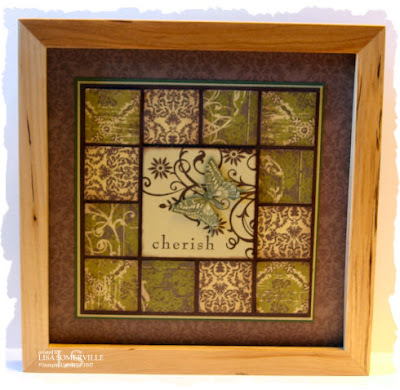 ETA - the grid frame shown above was just an inspiration piece, I had in my stash of alterables, my artwork is not put into that frame. The frame used above for my finished piece is an 8x8 shadow box frame. Oh my gosh, that is just fabulous!!! I need to come to your house and dig through your stash!!! Fabulous, idea, that is going to look great on a wall. What no santa? This is just supper. What a great idea and it turn out awesome! Too cool, Lisa!!!!!!!!! I just love that frame. Someday, I'll be as cool as you! WOW I love this! Seems like everyone is gettign inspired my wall art! THis is so great. Again...WOW! I love how your frame turned out, Lisa. Great job! oooh...this is wonderful Lisa. I HAVE to have one of thos frames. You have truly inspired ME to run out and find one. I only home mine turns out half as nice as yours did!!! this is quite a masterpiece! Girl, you outdid yourself with that piece, it's absolutely stunning!!! Gorgeous layout and artwork! what a lovely project!! I love that stamp set and what you've created with it. TFS! This is beautiful! Amazing job...thanks for the continuous inspiration! That's very neat, great idea!! What a beautiful frame Lisa! It looks like it belongs in the pottery barn catalog for big bucks!! Lisa, this is STUNNING - a true show stopper. What a great looking piece of put on a wall. Thank you for sharing such an inspiration for home decor. OH MY -- THIS IS A MASTERPIECE -- boy you are so talented!!!! BTW -- love the new picture. Your frame is beautiful! I would of never thought of doing that but I'll now be on hunt for a similar frame. I got that email too, and LOVED the colors! Your project using it as inspiration is just awesome!! Oh My Lisa, this is Just Beautiful!!!!! it would look SO perfect in my Living Room..........Your Piece is Very inspiring!!!!! Awesome! Love the papers. You are VERY talented. 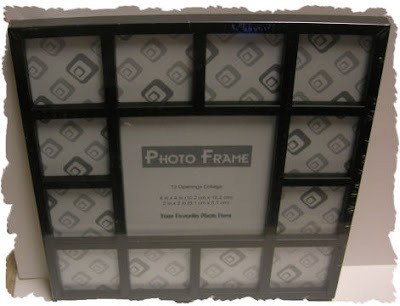 Do you remember where you found that fantastic frame? Lisa, your art is beautiful! I love how your framed turned out! Wow! This turned out SO beautiful! It's fun to see the designer's thought process! I really love what you have done- beautiful work! This is amazing! What a great job! Just love the inspiration...a scrapbook ad! WOW! OH MY thats soo beautiful and I saw the same kind of frame today at Target! I knew that I should have gotten it! WONDERFUL work as always.